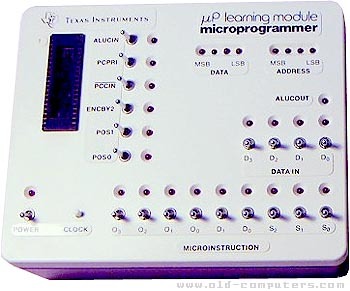 Almost no information about this 'computer' which was probably the first microprocessor trainer Texas Instruments produced. The system held two chips, a quad-Nand 74279 logic chip and a 4-bit SPB0400 processor which was the first processor made using the VLSI process technology. One programmed it through various switchs, results were displayed on LED diodes. Thanks to Steve Perry for information and pictures. see more Texas Instruments LCM-1001 Ebay auctions !